Last night was a drippy, rainy evening in Seattle. I drove down to the waterfront to go to a dance hall but try as I might, I couldn’t find it. I kept walking up and down the sidewalk, retracing my steps, certain I was in the right area and then thought, maybe it had closed?! I was sopping wet by then (because of course, living in Seattle, I never carry an umbrella). The clerk behind the counter looked bored that no one was coming in that night (and probably waiting to go home). So, spontaneously, I asked her, ‘Can I ride the carousel?’. 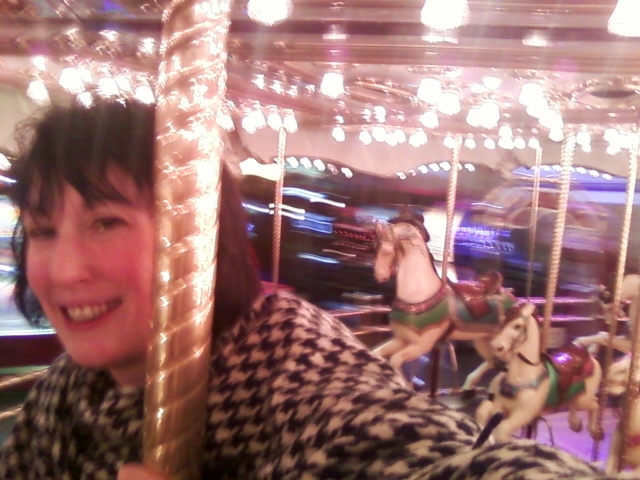 She looked amused, this grown, rain-soaked woman wanting a ride on the merry-go-round at 8:30 at night. And then, the carousel started slowing down, coming to an end. I got off and thanked the clerk who looked genuinely happy I had yielded over to my child-self. Well, that’s my perspective. I think the clerk was happy to witness a grown woman having fun before she closed for the night. Walking back out into the rain, I could feel an inner warmth. That was fun! Even though I couldn’t find the dance hall I was looking for, I found a bit of joy spurred on by the magic of the merry-go-round. And in the process, came back into the moment. Love this story….it’s an inspriation to the inner child in us all! Thanks so much Charmaine! The experience keeps coming through this day!